The Black Tip shark is a coastal shark that does arial leaps out of the water. They are fast and can be aggressive. A Black Tip Shark fish is a unique trophy that will be a centerpiece in most surroundings. The Blacktip Shark (Carcharhinus limbatus) aka black fin shark or grey shark is a true delight for fishermen. They are dark gray or blue to brown on the dorsal side with a white ventral side and a white band across the flank. The pectoral fins, first and second dorsal fins, pelvic fins, and lower caudal lobe are black tipped. The maximum reported length of the blacktip shark is 2.55 m (8.3 ft.); average adult size is around 1.5 m (4.9 ft.) and weighs about 18 kg (40 lbs) The maximum age of blacktip is thought to be at least 12 years. This unique species is found in tropical and subtropical coastal, shelf, and island waters in the Atlantic. 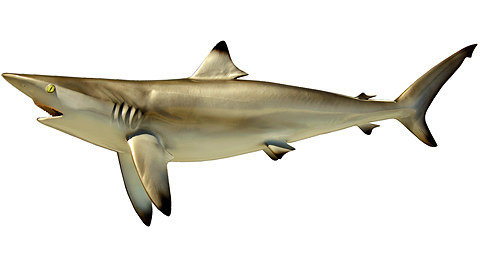 However the Black tip sharks are world travelers, as they migrate seasonally between Brazil and Nova Scotia, the Gulf of Mexico and Caribbean Sea, throughout the Mediterranean, and along the central West coast of Africa. In the Pacific they range from Southern California to Peru, including the Sea of Cortez, the Galápagos Islands, Hawaii, Tahiti, and other Southern Pacific Islands, to the northern coast of Australia. In the Indian Ocean they range from South Africa and Madagascar up to the Red Sea, Persian Gulf, throughout India’s coast, and east to the coast of China. They can be found in both inshore and offshore waters, but they tend to stay close to the coasts at depths of 30 m (roughly 100 ft.) or less. They are often seen near river mouths, bays, and mangroves, although they do not penetrate far into freshwater. Leaping out of the water and spinning several times is typical behavior for a Black Tip. Sometimes these leaps are the end action of a feeding run, when they move toward the waters surface through schools of small fish and their momentum catapults them into the air. The Black tip is a fairly curious and generally a timid shark. They can become very aggressive when feeding or in the presence of food. When hooked, the Blacktip shark and its long runs and jumping ability is amazing to watch. It is one of the few sharks that have the ability to spin in the air. It is fast, strong and has been known to bite humans in shallow water.